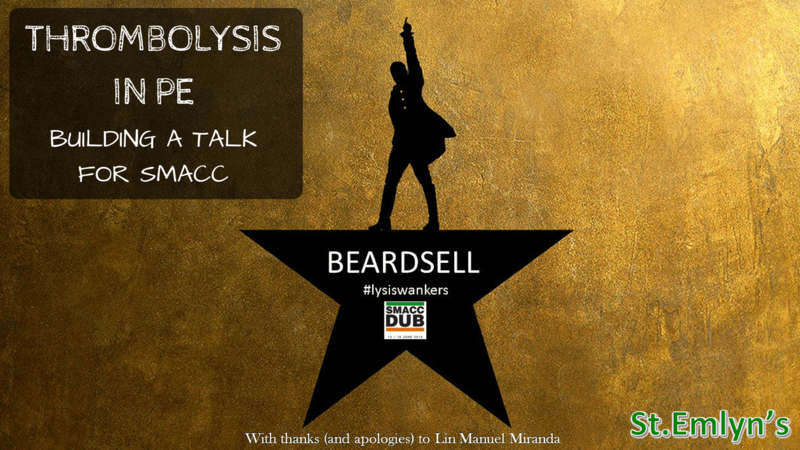 Thrombolysis in PE – Building a talk for SMACC. There’s an intoxicating combination of excitement and fear when you get an email asking you to speak at SMACC. You know that the standard demanded is exceptionally high, but there is a thrill that you have been asked and will get to play a small part in a very special conference. When I heard I was in a debate with Anand Swaminathan (or “Swami”) as he is better known the fear began to overwhealm the excitement. Swarmi is internationally recognized not only as a superb educator, but also has one of the smoothest voices to listen to. How would I, a relative unknown English guy ever be able to compete? Like many emergency physicians with a penchant for leaving things a little late it wasn’t until three months before the conference that I started to think about this seriously (three months may seem like a long time, but in the SMACC preparation universe it’s nothing – my talk the previous year had taken a 12 months to get right). In a moment of lazy serendipity, whilst watching youtube videos I came across James Corden talking about his work comparing the Tony Awards and he mentioned in passing a new musical taking Broadway by storm: “Hamilton”. As these things do, one you tube video led to another and soon I was streaming the music to this unbelievable music constantly struck by its ability to entertain and effortlessly educate. Hang on. How about it I could somehow use this format for my SMACC debate? A very Englishman rapping and singing – no one would expect that. Before I could see sense I canvassed opinion from a trusted advisor…. He didn’t say it would work, but he didn’t say it wouldn’t either. After hours of listening I chose two songs that combined both the “rap battle” (Cabinet Battle #2) and something with a bit of “real” singing (Washington on my Side), immediately changing that to “Evidence on my Side” and the idea grew. I was very lucky that my topic to debate was “PE” or “Pulmonary Embolus” both of which have plenty of possible rhymes. I read up around the topic, as you would for any talk like this, but by far the most useful was the “Life in the Fast Lane” blog article written earlier this year. The words came surprisingly fast and the whole thing was written in one afternoon. I used a few of the lyrics from the original songs especially at the start of sections eg “When we were on death’s door, when we were needy” became “When your patient’s on death’s door with massive PE” and used the original rhythms as a guide. Next came the backing music. A quick Google search revealed some versions that had been recorded and released on Youtube. I even spotted a comment from Lin Manuel Miranda (the originator, star and composer of Hamilton) where he had stated he was happy for someone to use the music for a project similar to mine, so I was reassured that should my version ever be heard by him (or his lawyers) they wouldn’t want to sue me. I used “Audacity” (the same free editing tool we use for podcasts) to record the tracks of the internet and using my (inexpensive) microphone recorded practice tracks. Then the real work started. My commute to work is about 20 minutes. On every journey I rehearsed singing along until the words were memorized. I’d estimate I must’ve sung them at least 200 times before they finally stuck in my head. The two final parts were recording some backing vocals for the last section (done using my same cheap microphone and Audacity) and then designing some slides that would project during the performance. The backing track was tricky and I had to buy the sheet music to be sure I was somewhere near the right notes. The slides were fun to put together – I wanted them to help illustrate the lyrics in case I stumbled or wasn’t audible at times, but I decided against a completely “karaoke” version with all the lyrics – I didn’t want the audience to be looking at the screen the whole time. As I have with all my SMACC talks I managed to sneak in a couple of pictures of my children too. The slides were put into a movie along with the music, so played automatically. I keep the format for the talk secret from all but a few close friends. I didn’t tell Swarmi (sorry pal). I did think about it, but then decided the element of surprise would be more fun. Every big talk I do, I try to have a “twist” which surprises the audience. I guess this idea came from my work on the TV show “Casualty” which always had an “Act 4 Crisis” – a point where those watching are surprised. This time it was the decision to start by trying to look like a bumbling, frankly “non SMACC” presenter: dodgy slides, stuttering delivery and all. I wanted the audience to wonder what was going on, and even to start to feel ever so slightly uncomfortable, so that when the music started it would be a complete reversal of what they thought they were watching. I enlisted some planted hecklers (thanks Nat, Ash, Simon and Liz), and the stage was set. I managed a quick practice at lunchtime with some exceptionally helpful AV guys at the conference venue and then all I had to do was pull it off. I really enjoyed the whole process of putting the talk together and so delighted that the performance went ok (there are some bits I would do differently if I had chance to do it again and my singing wasn’t perfectly in tune throughout), but I came away happy to have been a small part of this extraordinary event. There were so many excellent speakers with so many different styles and it is that mix that makes SMACC so special. You really do have the opportunity to tell your story in whatever way you want. You never know if you’re going to be invited back for the next conference, and it’s always hard to emulate or exceed what you have done in previous years, but I’ll enroll into “Circus School” just in case. Ed – Read more of Iain’s posts with links to past presentations here. Previous: Previous post: Sci-Hub. The pirate future of medical publishing? St.Emlyn’s. Iain, I commend you for your courage and dedication in creating a unique presentation. Perhaps you picked up some ideas for your more routine talks that you normally do throughout the year? But wouldn’t it be easier for such events to just outsource our important messages to professional producers and performers who already have the experience and resources to do it on a regular basis? Awesome, just full of awe.